Throughout this journey from birth to death, we choose to question life, strive for improvement, seek out knowledge, and search for the divine. This is the essence of spirituality, whatever your brand may be. One’s spiritual practice can take on many forms, because embracing the spiritual is a very personal pursuit. While many people do relate their spirituality to a God or Goddess, this quest for the divine, or oneness with the universe, always springs from within. It doesn’t matter where you find your spiritual path. We are all fundamentally spiritual beings and the essence of that lies in knowing one’s true self and finding a peace that comes from within rather than the outside world. It is in remembering this that we awaken to our personal path. Accepting the importance of spirituality can be a healthy decision, because a spiritual practice tends to include habits that promote healthy living. Take the time to carefully determine the action, thought, and ritual that most speaks to your soul. Remember that your most profound spiritual experiences may also come from the simple intricacies that make up your life. See the interconnectedness of all things. As you explore your “inner work,” you will be walking your spiritual path and feeling your oneness with the universe. 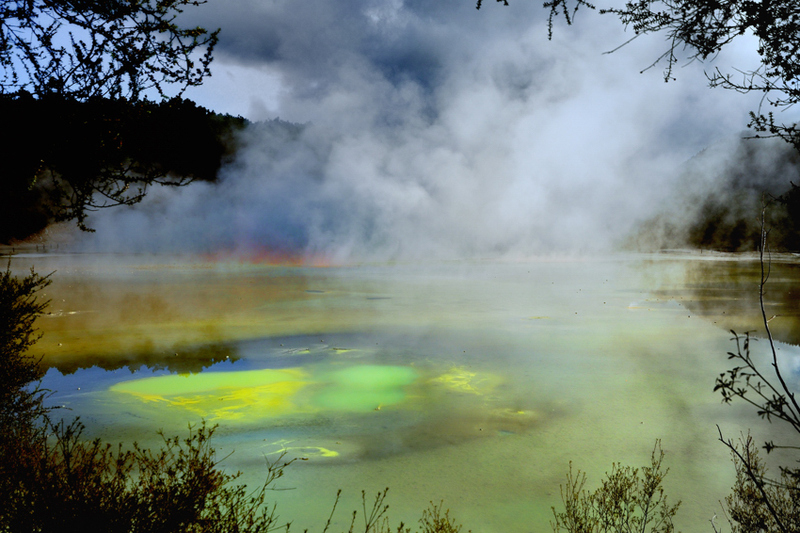 The image today is from the geothermal region around Rotorua in New Zealand. This wooden walkway leads through the Champagne Pool area (to the right) and off into the mist where other wonders await. During peak times this can be awash with visitors, but in the NZ winter and first thing in the morning during a work day, all that greated us was silence, hissing and bubbling sounds and, of course, the pervasive sulphuric air. It seemed like we had been transported to a different planet which beckoned us to explore its riches! On the path of personal and spiritual growth we have a tendency to analyze our unhappiness in order to find the causes and make improvements. But it is just as important, if not more so, to analyze our happiness. Since we have the ability to rise above and observe our emotions, we can recognize when we are feeling joyful and content. Then we can harness the power of the moment by savoring our feelings and taking time to be grateful for them. Recognition is the first step in creating change, therefore recognizing what it feels like to be happy is the first step toward sustaining happiness in our lives. 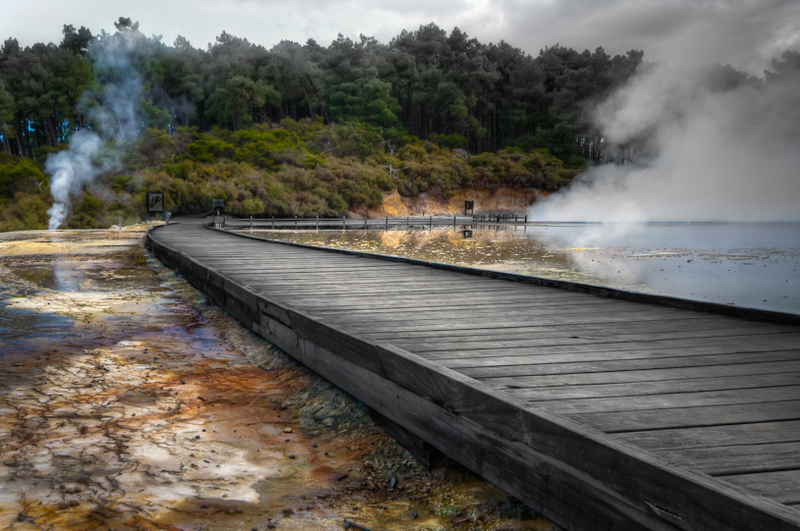 This is an image shot in New Zealand’s geothermal region around Rotorua on the North Island. It is a steamy, bubbling, smelly, vibrant and magical place, especially first thing in the morning and in the winter when we found ourselves to be the only people in the park. The Champagne Pool is by far the most spectacular and photographed. 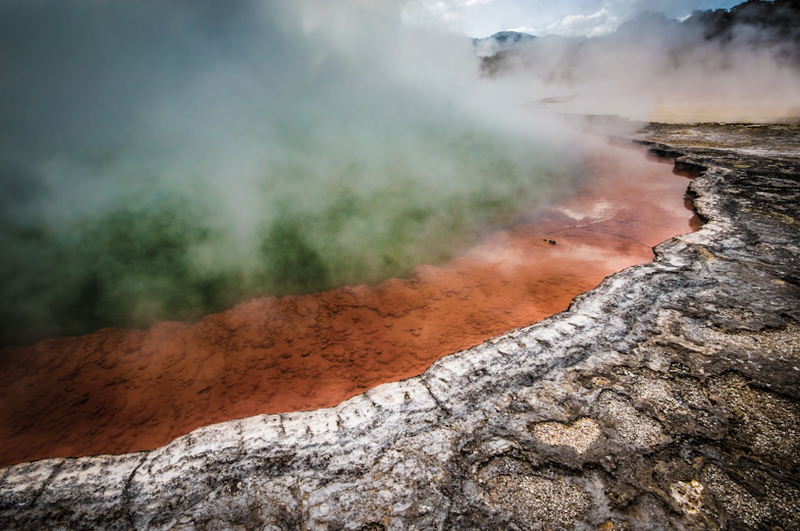 When shooting here, this photographer got a bit too close to the steamy edge to set up this sweeping shot and was surprised to hear the pitter patter of footsteps as a Park ranger came in a rush to sternly remind him of the dangers of falling into hot water! There were several four letter words used and his point was well taken – this photographer has been in many more perilous situations and this was, well, as walk in the park! Looking closely you may see a heart in the foreground – somehow this harkened to the message above of finding happiness amongst all of those other seething and churning emotions…guess you just have to look! Seek and yee shall find? To purchase a Digital Download or Print of this spectacular and unique image just follow this link to our website – this looks brilliant in large size! We all begin our day not truly knowing what lies in front of us, we follow our paths, often into a nebulous and uncertain future. We understand where we have been, likely know where we are, have an idea of where we would like to go, but where today’s path leads us, is for the most part, unknown. The decisions you make along the way will make all the difference. If you’re in a negative place, the next step you take can be in a positive direction. If you’re feeling down, with your thoughts and actions you can lift yourself up. Advance forward with your own meaningful, positive intentions. When life has been tough and painful, grab the opportunity to make it richer and more fulfilling. Every moment is an opportunity for growth and advancement, no matter what has happened in the moments before. Seize each opportunity, and quickly leave life’s disappointments behind. 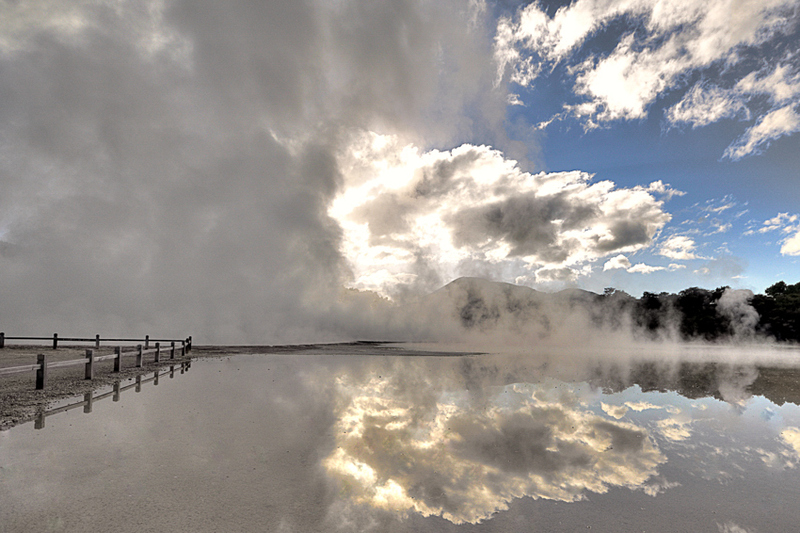 This image is from Rotorua, New Zealand shot late in the afternoon in July (Winter) at the breathtaking Geothermal Park. 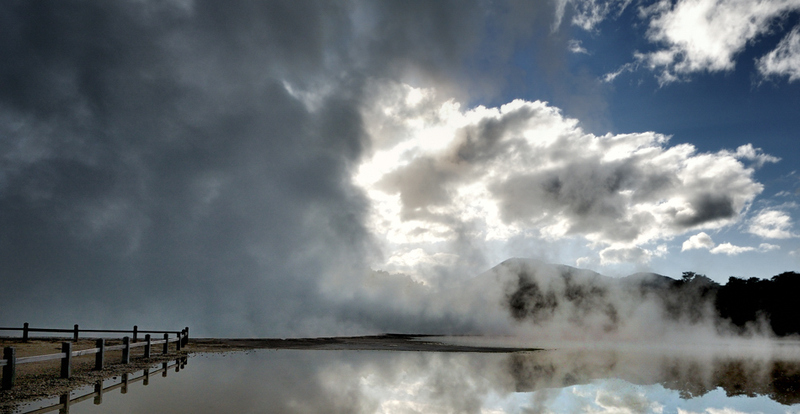 The mist on the left is generated by The Champagne Pool, a geothermal caldera – the air during the Winter was rather chilly and accentuated the condensation effects. The wooden walkway extends all around the Champagne Pool and also allows a look at The Painter’s Pallet which is awash with vibrant colors…along our trek into the mist, we never knew what gems we would discover – it was magical! This was a very early morning shot of an area of Rotorua’s Wai-o-Tapu Park’s geothermal area, this one is called The Artist’s Pallette. The air temperature was around 40F and the water temperature generated this enormous cloud of sulphur steam above the colorful mineral deposits. We were the first people in the area which was later inundated with school kids on tour. These formations reminded me of tiny Tufas in the making, but alas they are Travertine. 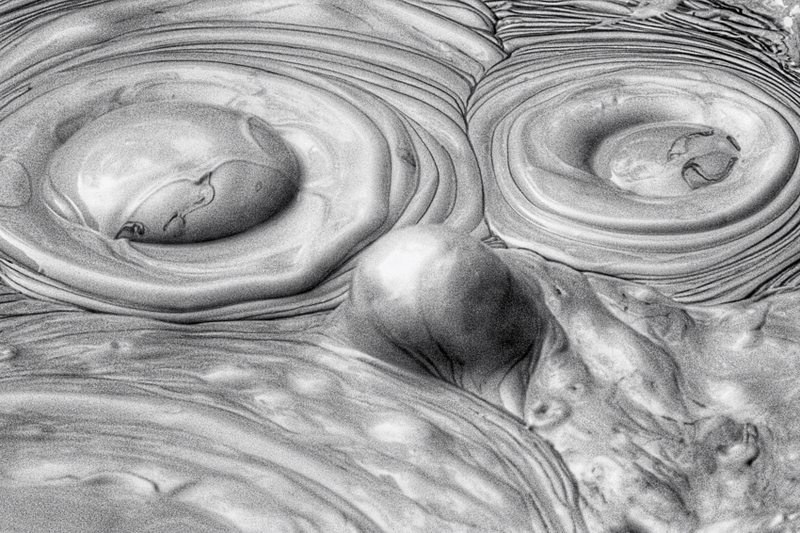 Travertine is a terrestrial sedimentary rock, formed by the precipitation of carbonate materials from solution in ground and surface waters, and/or geothermally heated hot-springs like this one. Similar (but softer and extremely porous) deposits formed from ambient-temperature water are known as Tufa which can be spotted in Mono Lake, CA. 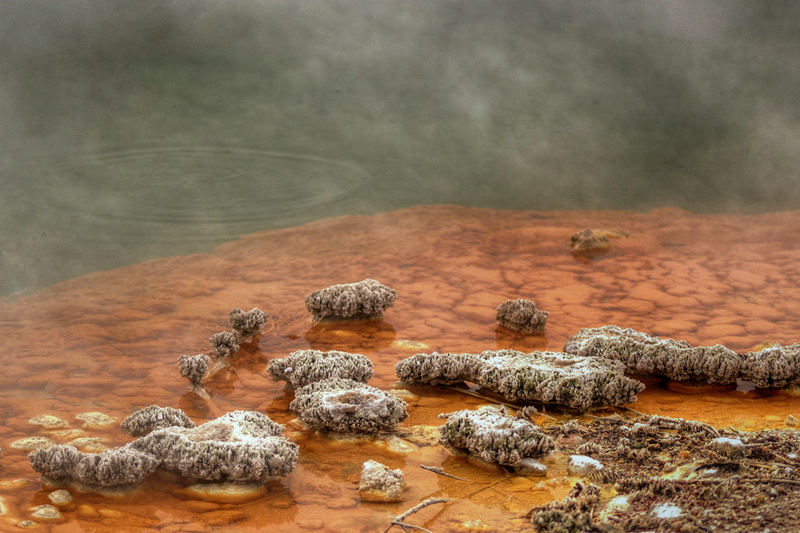 These are native to The Champagne Pool, in Rotorua, New Zealand. Recall when John Connor, Sarah and the Terminator, are in an abandoned industrial complex, which holds just the right sort of equipment to kill off the bad T-1000? After significant amount of mutual beating, the Terminator(Arnold) manages to kill the T-1000 in a vat of molten metal. This image reminds me of the death of the T-1000. This was taken late afternoon in July, cool atmospheric temperatures were accentuating the steam coming from the Champagne Pool (previous blog image). The reflection of the steam in the water was magical.